Following our in-depth investigations into the movements, cases, bezels, bracelets, and dials we have now arrived at the sixth chapter of our Important Parts of a Rolex Watch series. We will be examining the different types of metals Rolex uses to produce their watches—both historically and currently. Whether for an everyday watch, a sports watch, or even a dress watch, stainless steel is a great look for a Rolex. It is the most ubiquitous metal used at Rolex and aside from the Day-Date and the Pearlmaster collections, it is available as an option across all models. 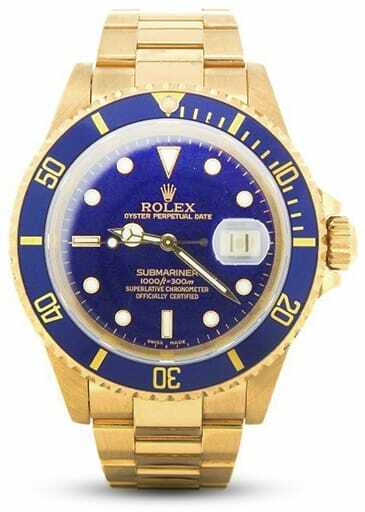 In fact, iconic Rolex tool watches like the Submariner, GMT-Master, and Daytona began as stainless steel models before Rolex began offering more luxurious gold options. For most of the company’s history, Rolex relied on industry-standard 316L stainless steel to craft their watches. 316L stainless steel is prized for its anti-corrosion properties and durability and it is often referred to as “marine grade steel.” Side note, the “L” in 316L stands for low carbon version of 316 steel, which is a superior choice for high temptations and welding. As we have seen countless times before, Rolex is always focused on improving details—big or small. And that is why in 1985, the company became the first watchmaking brand to use a 904L stainless steel for its cases. It started with the Sea-Dweller and Rolex eventually transitioned all steel Rolex models to 904L steel cases. It is interesting to note that Rolex used 904L stainless steel for their cases while continuing to use 316L stainless steel for their bracelets. However, that changed in the 2000s, when Rolex began exclusively using 904L stainless steel for both cases and bracelets. So how is 904L stainless steel different to 316L stainless steel? Rolex refers to 904L stainless steel as a “superalloy” as it offers even better resistance to corrosion and is more durable than 316L stainless steel. What’s more, it also provides an exceptional sheen after polishing. In 2018, Rolex began referring to the 904L stainless steel they use as Oystersteel because the company states that they developed the formula of their specific steel alloy. Rolex does not make 904L stainless steel in-house but relies on select suppliers to provide it. But in true Rolex fashion, the quality-obsessed company checks every Oystersteel casting in their central lab using a scanning electron microscope prior to the material making it to the watch manufacturing stage. After steel, gold is the second most popular metal used to make Rolex watches—and not just one shade, but in fact three: yellow gold, white gold, and rose gold. Contrary to popular belief, not all gold Rolex watches are 18k gold; there are in fact, vintage Rolex watches made from 9k and 14k gold. There are even gold shell vintage Rolex watches out there, made using a technique of bonding a thick layer of yellow gold to steel. Today, however, Rolex only uses 18k gold to make its watches. Rolex has four different sites around Switzerland and the one in Plans-les-Ouates (built in 2006) houses Rolex’s private foundry. Yes, Rolex makes its own exclusive gold alloys in its own in-house foundry. Pure gold is 24k and it is too malleable to use to make robust wristwatches. So, Rolex opts for 18k gold, which is 75% gold and 25% other metals. Adding certain amounts of the other metals, which can include silver, copper, platinum, and others is what yields the different gold colors we are familiar with. Therefore, Rolex can control the exact formulas of their gold alloys in their private foundry. While Rolex has been using rose gold in their watches for decades, in 2005 they announced a patented rose gold alloy they call Everose. This particular gold derives its name from Rolex’s promise that this proprietary pink gold will never fade—it will remain (for)everose. All of today’s rose gold Rolex watches are fashioned from Everose gold. The most precious of watchmaking metals, Rolex uses platinum sparingly in its collection compared to steel and gold. There are of course platinum Day-Date President watches, platinum Lady-Datejust President watches, and platinum Daytona watches. 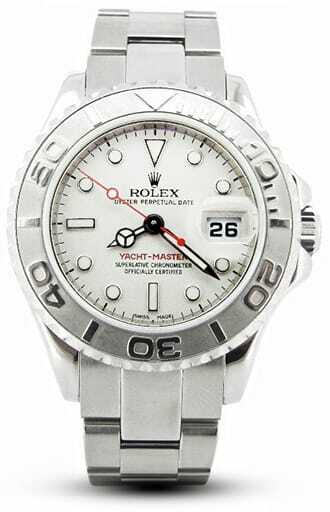 Rolex also uses platinum on some Yacht-Master bezels and dials and on the bezel of the white gold Yacht-Master II. Furthermore, Rolex uses platinum, applied via PVD, as a coating on Cerachrom ceramic bezels placed on white metal Rolex watches. 950 platinum is the preferred platinum used by Rolex, which is comprised of 95% platinum and 5% ruthenium. Although platinum is also a white metal, it has a different luster to white gold and stainless steel. But, to further distinguish the use of platinum on their watches, Rolex often pairs it with an ice blue dial—a color exclusive to platinum Rolex watches. Along with making full steel, full gold, and full platinum watches, Rolex also likes to mix and match metals. For instance, when Rolex uses both gold and steel on one watch, they officially called it Rolesor (where “or” is the French word for gold). Rolex patented the name Rolesor in 1933 and introduced the design on a Datejust in 1948. Rolesor watches can use either yellow gold, rose gold, or white gold in combination with steel. Yellow (or rose) gold and steel Rolex watches are often simply called two-tone Rolex watches in casual conversation. In a two-tone Rolesor watch, the bezel, winding crown, and center bracelet links are produced in yellow or rose gold, while the rest of the watch is made in steel. This has become a signature Rolex design trait. Conversely, on white gold Rolesor watches, the white gold is only used to make the bezel and the rest of the watch is in steel. On the other hand, Rolesium refers to the combination of steel and platinum on a Rolex watch—currently only available with the Yacht-Master and Yacht-Master II watches. On Rolesium watches, the case and bracelet are made in stainless steel while the bezel is made from platinum. The platinum bezels feature two types of finishes: a sandblasted background and high-polished raised numerals. Some Rolesium Yacht-Master watches also have sandblasted platinum dials, which capture the light beautifully. It may come as a surprise to some, but Rolex did at one point in their history make sterling silver watches. Sterling silver Rolex watches pre-date the Oyster case (1926) and these vintage pieces come in a multitude of different shaped cases. Rolex has made square silver cases, rectangular silver cases, cushion-shaped silver cases, decorative ladies’ silver cases, and even silver trench officer’s cases complete with a hinged caseback that can be opened and closed. 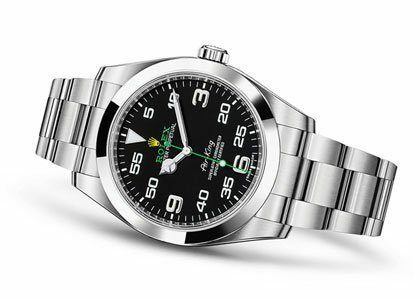 Rolex no longer makes sterling silver watches and given the metal’s propensity to tarnishing and its susceptibility to scratching, that is not surprising.